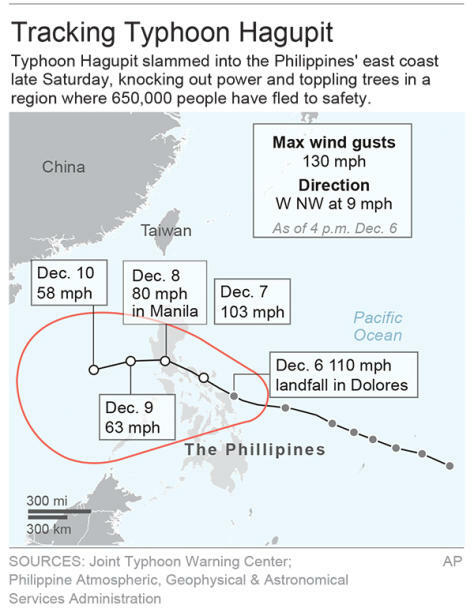 LEGAZPI, Philippines (AP) — Typhoon Hagupit knocked out power, mowed down trees and sent more than 800,000 people into shelters before it weakened Sunday, sparing the central Philippines the type of devastation that a monster storm brought to the region last year. Shallow floods, damaged shanties and ripped off store signs and tin roofs were a common sight across the region, but there were no confirmed deaths or major destruction after Hagupit slammed into Eastern Samar and other island provinces. It was packing maximum sustained winds of 140 kilometers (87 miles) per hour and gusts of 170 kph (106 mph) on Sunday, considerably weaker from its peak power but still a potentially deadly storm, according to forecasters. Traumatized by Typhoon Haiyan's massive death and destruction, more than 800,000 people fled to about 1,000 emergency shelters and safer grounds. The government, backed by the 120,000-strong military, had launched massive preparations to attain a zero-casualty target. Rhea Estuna, a 29-year-old mother of one, fled Thursday to an evacuation center in Tacloban — the city hardest-hit by Haiyan last year — and waited in fear as Hagupit's (HA'-goo-pit's), wind and rain lashed the school where she and her family sought refuge. When she peered outside Sunday, she said she saw a starkly different aftermath than the one she witnessed last year after Haiyan struck. "There were no bodies scattered on the road, no big mounds of debris," Estuna told The Associated Press by cellphone. "Thanks to God this typhoon wasn't as violent." Haiyan's tsunami-like storm surges and killer winds left thousands of people dead and leveled entire villages, most of them in and around Tacloban. Nearly a dozen countries, led by the United States and the European Union, have pledged to help in case of a catastrophe, disaster-response agency chief Alexander Pama said. The EU commissioner for humanitarian aid, Christos Stylianides, said a team of experts would be deployed to help assess the damage and needed response. "The Philippines are not alone as they brace up for a possible hardship," Stylianides said, adding that the European Commission was "hoping that the impact will be less powerful than a year ago, when Typhoon Haiyan left a devastating imprint on the country." Authorities were verifying reports of some deaths, but none had been confirmed so far, Pama told a news conference. While officials expressed relief, they were quick to warn that Hagupit — Filipino for "smash" or "lash" — was still on course to barrel across three major central islands before starting to blow away Tuesday into the South China Sea. "It's too early to tell," Philippine Red Cross Secretary-General Gwendolyn Pang said. "Let's cross our fingers that it will stay that way. It's too close to Christmas." Army troops deployed to supermarkets and major roads in provinces in the typhoon's path to prevent looting and chaos and clear debris, all of which slowed the government's response to Haiyan last year. Unlike past years, many people readily left high-risk communities ahead of Hagupit, Soliman said. "Haiyan was the best teacher of all," Soliman said. "People did not need much convincing to move to safety. In fact, many of them volunteered to go." Associated Press writers Oliver Teves and Jim Gomez in Manila, Philippines, contributed to this report. Balita 1 hr ago -- 3 dead. kumusta naman ang storm recently?